1. 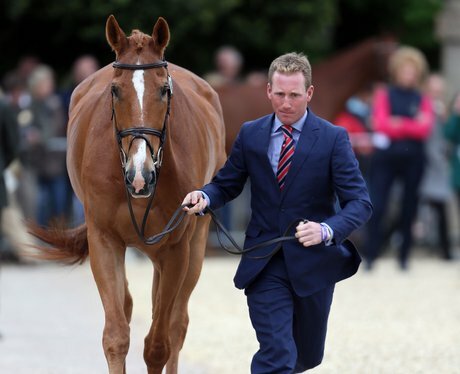 Great Britain's Oliver Townsend shows his horse Armada to the judges in the Horse inspection. 2. Belguim's Lara de Liedekerke shows her horse Ducati van den overdam to the judges. 3. Nicola Wilson shows her horse Annie Clover to the judges in the Horse inspection during day one. 4. New Zealand's Mark Todd shows his horse Leonidas II to the judges in the Horse inspection. 5. USA's Tiana Coudray shows her horse Ringwood Magister to the judges in the Horse inspection. 6. New Zealand's Mark Todd riding NZB Campino competes in the dressage phase during day two. 7. New Zealand's Mark Todd riding NZB Campino competes in the dressage phase during day two. 8. Great Britain's Pippa Funnell riding Billy Beware competes in the dressage phase during day two. 9. Australia's Lucinda Fredericks riding Flying Finish competes in the dressage phase during day two. 10. Great Britain's Harry Meade riding Wild Lone competes in the dressage phase during day two.